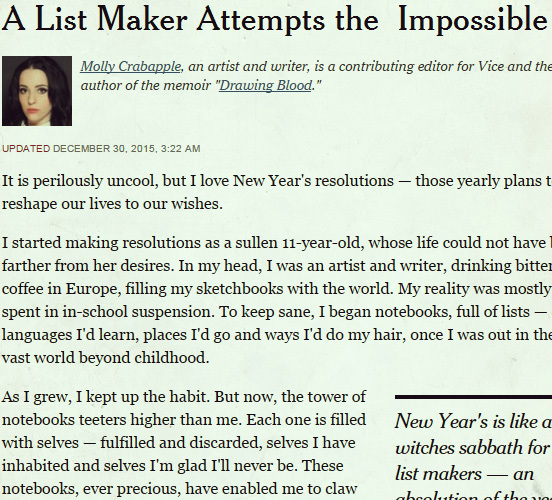 I started making resolutions as a sullen 11-year-old, whose life could not have been farther from her desires. In my head, I was an artist and writer, drinking bitter coffee in Europe, filling my sketchbooks with the world. My reality was mostly spent in in-school suspension. To keep sane, I began notebooks, full of lists — of languages I’d learn, places I’d go and ways I’d do my hair, once I was out in the vast world beyond childhood. This entry was posted in Uncategorized on December 30, 2015 by AC.